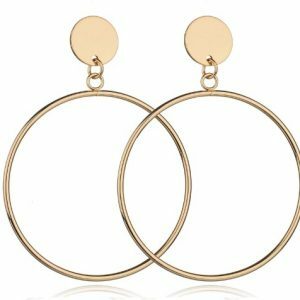 Here you will find the most beautiful drop earrings! Beautiful drop earrings with pendants and without. The drop earrings from Aphrodite are available in the colors silver and gold. Make your own ear party! 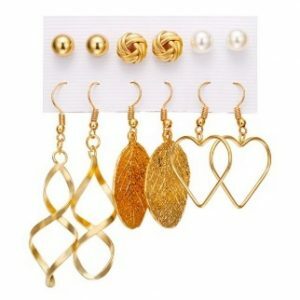 This earrings set consists of 6 pairs of nice earrings. Three stylish studs earrings and three earrings. Finish your look with other gold jewelry. For example with a nice layer of chain or with nice bracelets. Do you have questions about the 6 pair of gold earrings set? Send us a message. 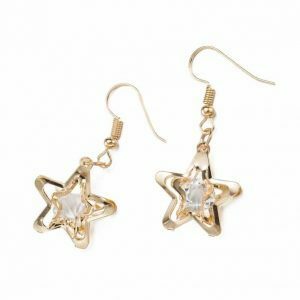 Do you have questions about gold star earrings with crystals? Feel free to send us a message. 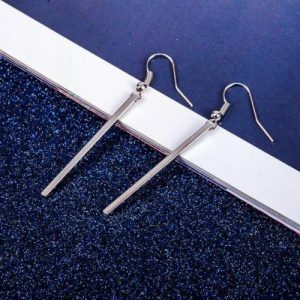 Give your outfit an update with these long minimalist earrings. The beautiful earrings have a bar design. You can easily combine it with other minimalist jewelry, through the subtle and fine design. Finish your look with a minimalist necklace with a pendant. Or with a nice bracelet. Do you have questions about the minimalist earrings with bar pendant ? Send us a message. At Aphrodite you will find the most beautiful earcandy! We have beautiful drop earrings that will complete your outfit. The drop earrings are available in the colors silver, gold and rose gold. 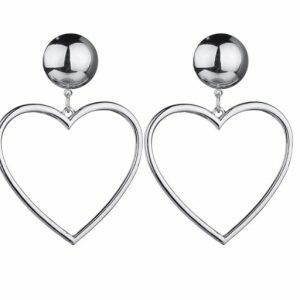 We have drop earrings with beautiful pendants such as with a heart or a beautiful circle. Combine your new drop earrings from Aphrodite with other fun jewelry. We also have other nice drop earrings in our jewelry webshop. We have beautiful drop earrings with pendants, the stylish earrings with leopard charm are very Hot! The v earrings that Monica Geuze wears are also very popular. They should certainly not be missing in your jewelry collection. You need different earrings for every occasion. When you go to school / work you can wear small studs or ear studs for example. When you need a boost to a party or outfit, you can wear large earrings with a striking design. You can shop for the creole earrings from Aphrodite in the colors silver and gold. By combining multiple jewellery you can make your own jewelry set. Wear several earrings together for an earparty! You can also combine them with other beautiful jewelry. Wearing multiple necklaces together is very hot right now! We have beautiful double necklace with nice pendants. Our layered necklace with coins are very popular. Our layered necklace is available in 2, 3, 4 or more layers. In addition to double necklacewith pendants, we also have layered necklaces with moons and stars. As a Valentine’s Day or Mother’s Day gift, the layered necklace with heart is great fun! You can combine your new layered necklace with your drop earrings. Do you want to give your outfit a cool touch? then the choker necklace is the solution. We have elegant beaded choker necklaces. But also cool choker necklace with a bar pendant for example. Do you prefer a feminine touch with your outfit? then the choker with heart is perfect for you. You can wear it together with heart earrings. You should also not forget to decorate your fingers. You can also order beautiful rings from us. You must not have missed the minimalist trend. We have thin, fine rings with modern designs but also with nice figures. You can easily combine your new minimalist ring from Aphrodite with your earrings. By wearing multiple rings together you can make your own ring party! Wear 3, 4, 5 or more lovely rings together. You can combine your statement ring with subtle rings. You can also combine your new earrings with the fine bracelets from Aphrodite. We have beautiful minimalist bracelets that will go well with your drop earrings. We have subtle bracelets with nice figures. The simple bracelets with a heart, star, moon, world map, compass and bar are a must have in your jewelry collection. We have beautiful bracelets with 2, 3, 4 and 5 nice bracelets. Sign up for our newsletter! this way you stay informed when we add new earrings to our collection.